Independent care homes in Scotland have claimed they are "on the breadline" because of pay pressures and a recruitment crisis. Scottish Care, which represents them, said further closures were likely without remedial action. A survey found 79% of homes were struggling to recruit nurses and 35% struggled to find suitable managers. The Scottish government said it had already taken action to ensure adult care workers received the living wage. The impact of Brexit was highlighted in the research. Nurses from the European Union were recruited by 63% of homes, with 44% also recruiting care staff from the EU. Annual staff turnover had risen to 22%, from 17% in 2015. Scottish Care chief executive Dr Donald Macaskill said: "We are struggling to recruit new staff and hold on to existing staff. There is a shortage of nurses which is little short of scandalous. There is a wholly inadequate resourcing of initiatives such as the Scottish Living Wage. "Put simply, care homes cannot continue to survive on the breadline. "Discussions on reform are coming to a critical stage. 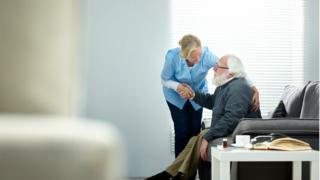 I hope this research sharpens the minds of all involved to realise that unless we identify real positive actions which include an adequate funding of care homes, we will be in a state which will be irretrievable." Of the 161 care homes responding to the survey, 42% said paying the Scottish Living Wage had made them less sustainable. Dr Macaskill added: "There is, at the moment, a small number of care homes closing because they simply cannot survive. It is incumbent on government at local and national level to recognise the real dangers this sector faces today and to respond accordingly, or within the year we will be faced with a real emergency. "We cannot continue to get care on the cheap." The Scottish government said it believed paying the living wage was important in "delivering quality care". But Health Secretary Shona Robison said she recognised the challenge posed by any change to the status of EU employees. She said: "Our care sector is just one of many in Scotland which rely on the hard work of people from elsewhere in the EU - and this survey is yet another stark reminder of how a hard Brexit could have a real detrimental impact on the services on which many people rely on a daily basis. "Raising the status of social care as a profession, and attracting and retaining the right people, is key to delivering quality care. "That is why we have taken action to protect care services, including paying the Living Wage to adult care workers boosting the income of up to 40,000 people. This commitment is in place for care workers in both public and private sectors." She said additional funding was being made available, adding: "In the current year, there will be almost half a billion pounds of NHS investment in social care and integration, underlining that we are treating this as a key priority. "We are also working with Cosla and care providers to deliver major reforms to adult social care, which will consider workforce issues and new models of care and support."